Today begins just as any other day. My husband disappears from his family and husbandly duties and retreats into the office bathroom, not to be seen for the next hour. It is in this bathroom that he will meditate and he has been doing this longer than when I first met him eight years ago. This is where he sits daily in order to prepare for the daily challenges that lie ahead for him in the office and with life in general. I’m not sure what he does in there exactly, but what I do know is that he is undoubtedly the most mindful husband and father that our family could hope for and in eight years, I’ve never seen his cage rattled – so I won’t disturb him (and the kids also know to do likewise). Later in the evening he will take to his asana practice, but his primary priority is to first take care of his mind. My own approach is a little different… I need to first take care of the body before I can begin to approach the complexities of my busy mind. This morning, like every Thursday morning, I’m very lucky to have my yogini partner, Tracy, practice yoga asana with me. Our relationship began when I first moved to Abu Dhabi six years ago and she sought me out as a yoga teacher. When I was later privileged to teach during the evenings at the beautiful Bodytree Studio, my morning practice became a time for my solitary self-practice and so I stopped teaching Tracy and instead I taught her my own self-practice so we could continue to practice together side by side. In time, I began to speak less until we could eventually flow together without uttering a single word for the 2 plus hour practice. For those 2 plus hours, all I need to do is focus on keeping my breath consistent through the poses I love, the poses that I resist and the poses that I feel I may have done a million times during the last two decades. We don’t pause to correct each other’s asana, or congratulate each other for a job well done – we just flow – as one. We have continued to flow through injury, sadness, pregnancy, elation, sickness, health and fear. In those two hours, nothing else exists but the flow of our breathe and our bodies. It is undoubtedly the most empowering part of my day. I will do the same yoga practice alone a couple more times over the next week but it’s unlikely I’ll be as disciplined as I will be today, for I may pause to attend to an ingrown hair in yoginidrasana or I could find an excuse to correct my ponytail before dropping back into kapotasana. I’m not sure why I sometimes do these things to stop the flow when I’m on my own but what I do know is that nothing is more satisfying than when I do not break the flow. It is perhaps a form of self-sabotage that we all know so well through our negative patterns or addictions that hold us back from greatness. I may find that flow later in the day when I sit down to play the piano when playing that same classical piece that I’ve been practicing for months. Parts of it have the flow and parts of it do not as yet. The joy is clearly in the parts that flow and the parts that do not as yet often test my level of patience. I believe that dancers know all about the enticing feeling of the flow as do musicians. When I watch my toddler chasing bubbles oblivious to her surroundings as if nothing else exists, then she is without a doubt experiencing the ecstasy of the flow. The difference is that she was born (as we all were) with this innate ability but she still remembers it whereas it takes me quite a bit of practice to find it so it can flow into other more mundane parts of my life. The challenge is whether I can maintain my calm breathe when my tween rolls her eyes at me again after I nag her about the same thing for the umpteenth time or if I can still remain with a calm breathe when my toddler asks me to read the same story book to her for the fifth consecutive time. Some days I might, some days I might not but I’ll keep practicing with the suspicion that I likely need a few more lifetimes to get just a little bit closer to enlightenment. Until then, I need to remind myself that this too shall pass – something I tell students when I suspect they might believe that they just can’t hold navasana for another moment longer. “Just three more breathes!” We can do so much in just one more breathe like birth a baby or stop from lashing out to an undeserving victim. In the end it’ll all be worth it so we can let go with grace as we do with savasana which is perhaps the point of it all… learning to let go with grace and ease. One consistent thing I will always have in this ever-changing world around me is my yoga practice regardless of if I’m too old or injured to perform asana. It’s a beautiful, messy and forever challenging world and I don’t know how the non-yogis do it for I don’t know who I am without it. 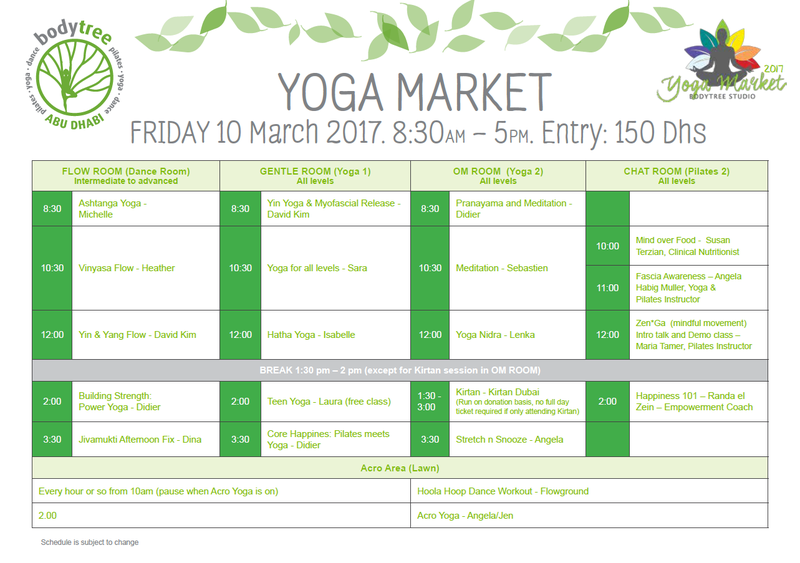 We have teamed up with Body Tree for the next Yoga Market on Friday, the 10th of March! If you would like to meet Michelle and take part in a class please see below for the full schedule.